Malcolm Turnbull is looking to an “ideas boom” to be the new source for Australia’s growth, prosperity and jobs now the mining boom has faded. Transforming Australia into an innovation powerhouse will require overcoming these 10 key challenges, writes.. The Turnbull government released its National Innovation and Science Agenda, setting out how it will encourage more startup activity and build a culture of innovation. As innovation policy expert Roy Green points out, Australia has had 60 reports at Commonwealth level on innovation in last 15 years. The $9.7bn the country spends on “research and innovation” is spread across 13 portfolios and 150 budget line items. Australia still has a long way to go to catch up to its regional and global counterparts, and we’ve set out the biggest challenges in the following charts. 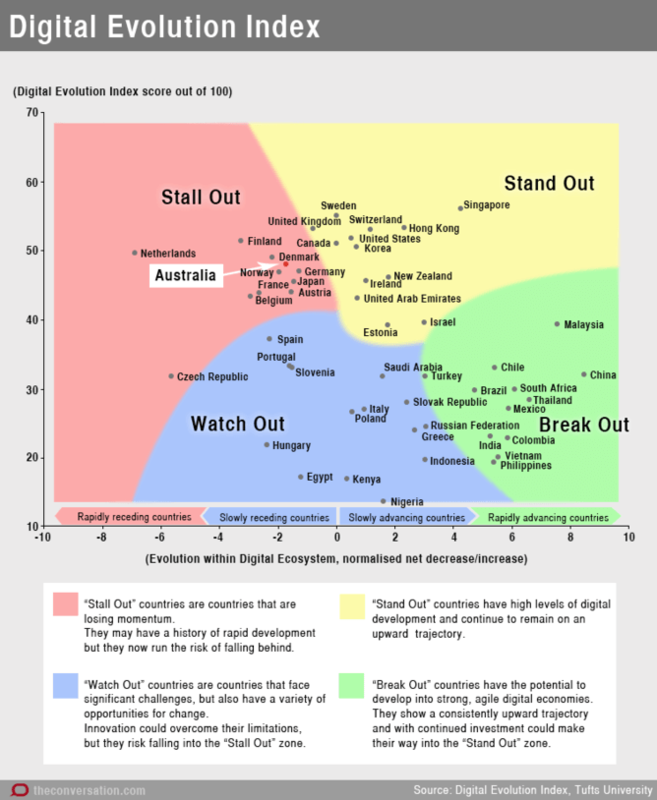 Australia is ranked 17th in the world, according to the Global Innovation Index. 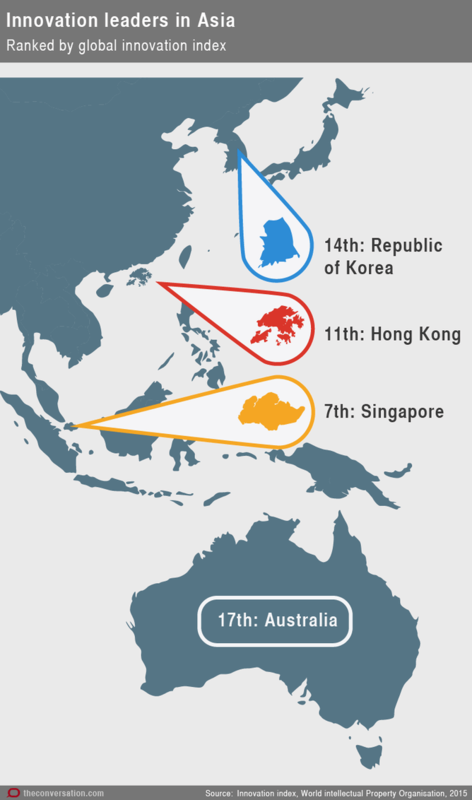 While this is not a bad performance, we are outperformed in our region by Singapore, Korea and China. This index measures both research outputs and “innovation efficiency” – how much innovation output a given country is getting for its inputs, based on turning research into commercial outcomes. On this measure Australia is ranked 72nd in the world. The government had acknowledged the need for Australia to transition its economy, but research from Tufts University suggests we have stalled. While we have achieved a high level of progress towards becoming a digital economy in the past, we are at risk of falling behind. The research argues “stall out” countries like Australia can only jump start their economies by redoubling on innovation and continuing to seek markets beyond domestic borders. 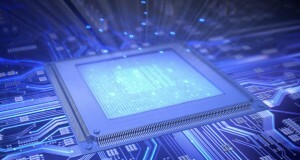 It also says attracting highly talented young immigrants could help revive innovation. 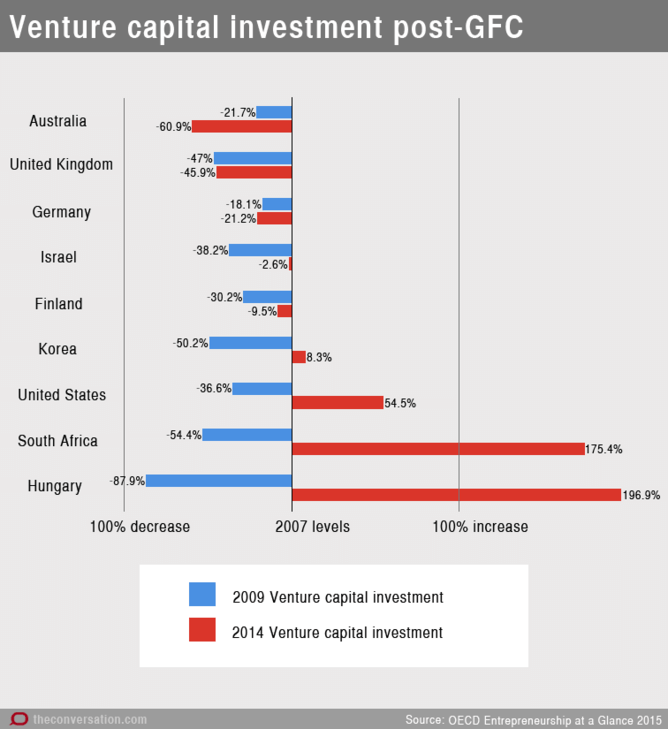 While venture capital investment has turned around in countries like the US, South Africa and Hungary, in Australia it fell significantly between 2009 and 2014. Australia’s venture capital market is still to recover from the global financial crisis. In 2005-06 3% of firms applying for venture capital investment were successful in getting it. In 2013-14 it was just over 1%, despite the number of proposals recovering to pre-GFC levels. 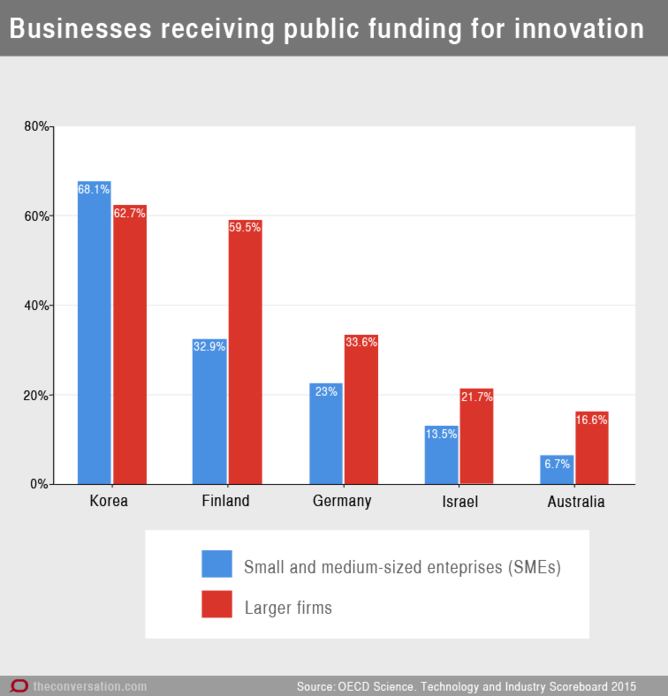 Australian businesses say a lack of access to additional funds is their biggest barrier to innovation. 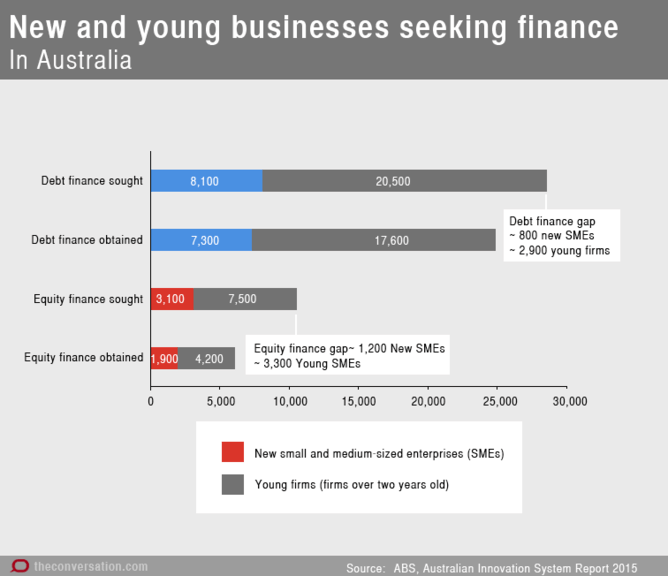 Startups also find it much harder to gain access to equity finance than debt finance. 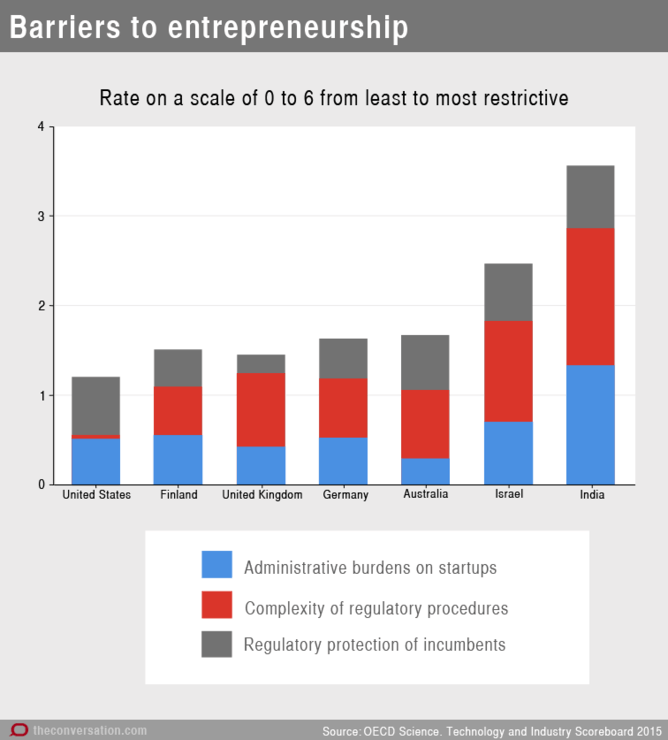 Barriers to entrepreneurship stand in the way of young innovative firms, according to the OECD. The barriers, which include the administrative burden of creating a new firm, the regulatory protection of incumbents, and the complexity of regulatory procedures, hardly shifted in the years between 2003 and 2013.
a tendency to network and collaborate. It found only 16% of Australian businesses have a high performance innovation culture in contrast to 44% of the Global Innovation 1000. 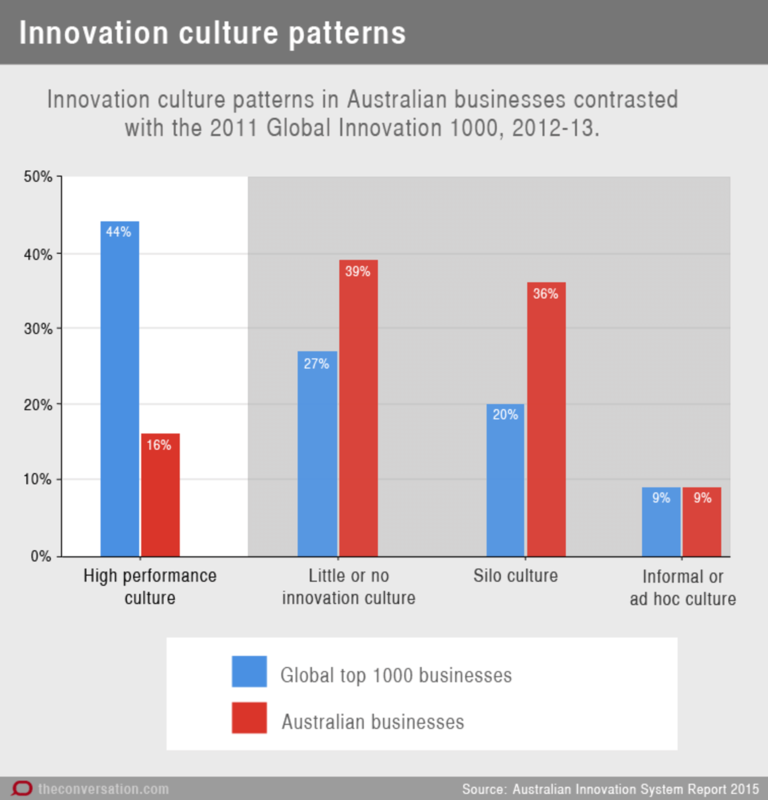 More than a third (36%) of Australian businesses had a “siloed” innovation culture, and 39% had little or no innovation culture. 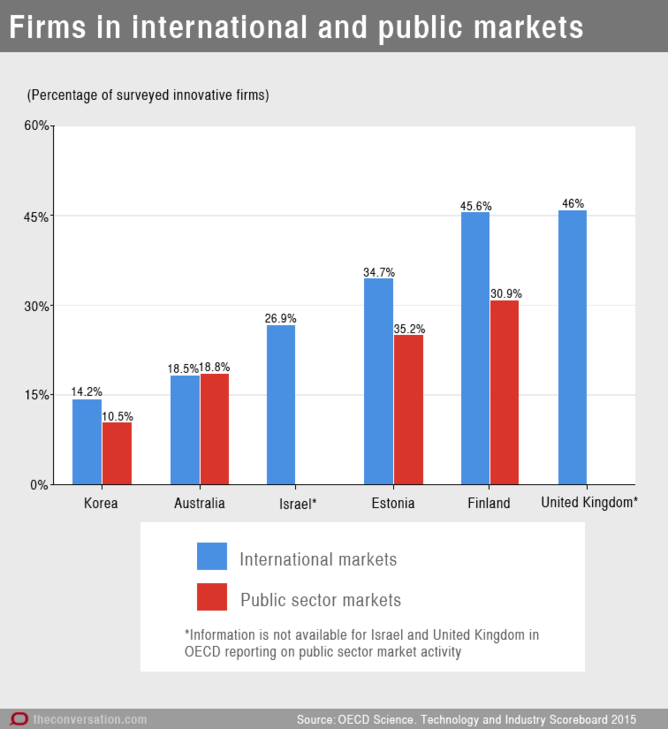 Innovative firms are far more likely to participate in international and public procurement markets, according to the OECD. But less than one in five Australian firms operate in these markets. Public support for innovation includes financial support via tax credits or deductions, grants, subsidised loans and loan guarantees. 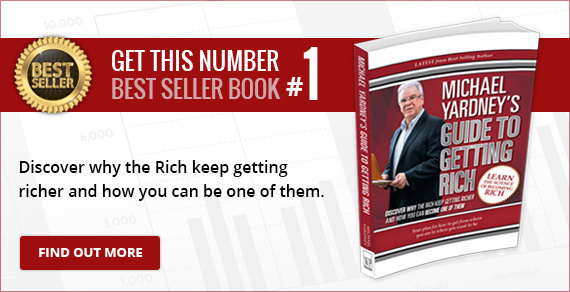 In Australia this type of support is largely going to large firms. 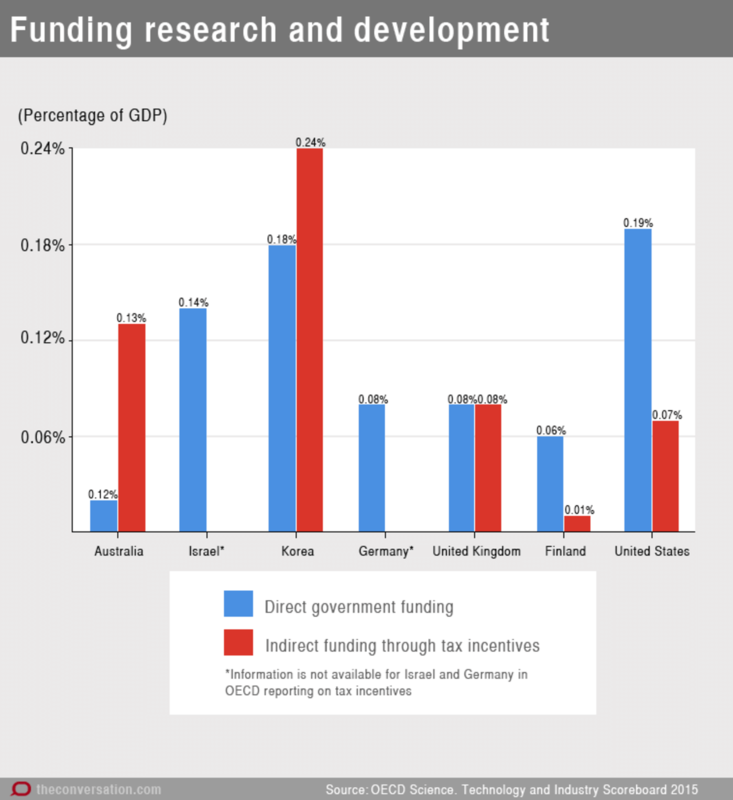 Part of the reason large firms benefit disproportionately from the investment by government to promote innovation is because of Australia’s generous research and development tax incentives. The OECD says while firms investing in R&D are more likely to introduce innovations, R&D tax incentives often do not meet the needs of young, innovative firms and risk amplifying cross-border tax planning by multinational firms. Prime Minister Turnbull has consistently pointed out the poor levels of collaboration between primary researchers, typically in universities, and business. He has singled this out as a priority to change. Charis Palmer, Deputy Business Editor, The Conversation; Darcy Shilton, Editor, The Conversation; Emil Jeyaratnam, Multimedia Editor, The Conversation, and Wes Mountain, Deputy Multimedia Editor, The Conversation.